Left image: Researchers used a molecule called Gap19 to block the hemichannels, which resulted in smaller stroke damage. Right image: The size of a stroke in a mouse’s brain without treatment by Gap19. 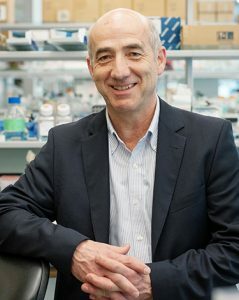 “Through the efforts of several labs, we were able to conduct in-depth explorations of channel protein function and its effect on disease treatment and outcome,” added Luc Leybaert of Ghent University.